This Tablecraft GPSSCADDY Brickhouse 10 3/4" x 8 1/2" stainless steel flatware caddy is the perfect way to add a casual yet sleek touch to your dining tables! It combines a shining, silver form with an imprinted brick pattern to add texture and visual interest to your table settings. Simply place it at the center or on the side of tables and add napkins, flatware, or packaged condiments to the four divided compartments to make them easily accessible to your patrons as they dine. Constructed of sturdy stainless steel, this caddy's durable side walls and rolled edges allow it to maintain its shape even with daily, heavy-duty use. Plus, the stylish wooden handle provides your employees with a way to easily move and refill it when necessary. Create unique table settings at your trendy diner or cafe with this Brickhouse caddy! What a nice way to display your utensils and napkins at a pop-up. Great product for the price and it looks great on any table, counter or display. 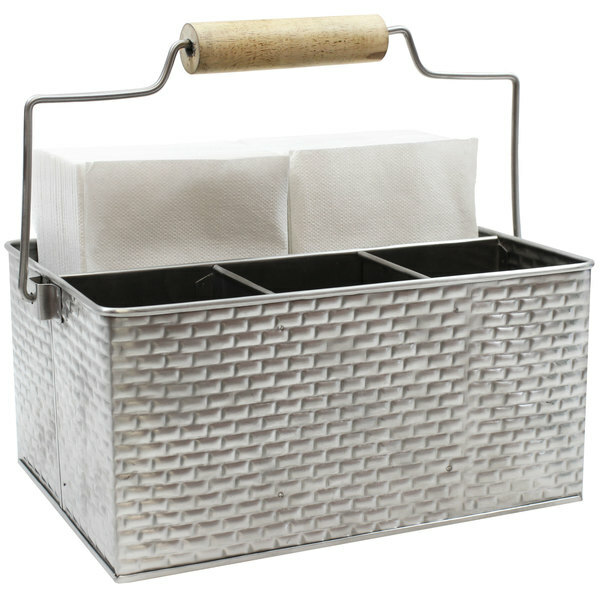 This Tablecraft flatware caddy is great. The stainless steel construction is well made. The matte silver color is easy to clean. And it holds a lot of utensils and napkins.